levelling of the structure can be attained. minimal risk of corrosion and a high probability of leak free construction. both sturdy and pliable and is therefore ideal for installations with difficult ground conditions (i.e. seismic zones or unstable soils). protected with a surface lacquering, made specifically for the production of these swimming pools. drainage. 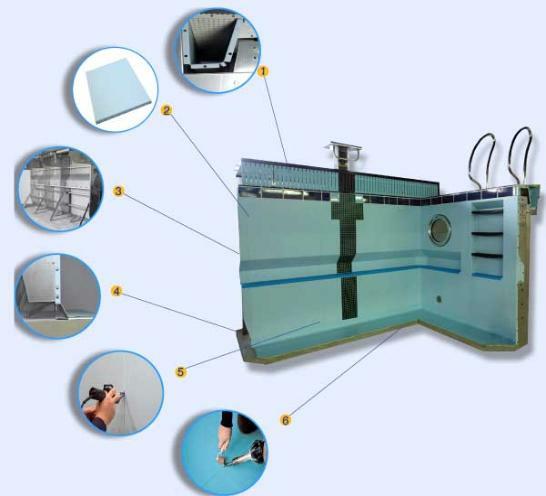 In any type of Myrtha® pool, this floor can be supplied with a user friendly “Softwalk” floor. racing lanes or safety markings using PVC membrane or special purpose mosaic tiles. extremely resistant and optically uniform to the panels surface.